This is one of those ‘I’ve had a horrific week and I need to eat my body weight in copious amounts of chocolate and sugar to make it better’ cakes. 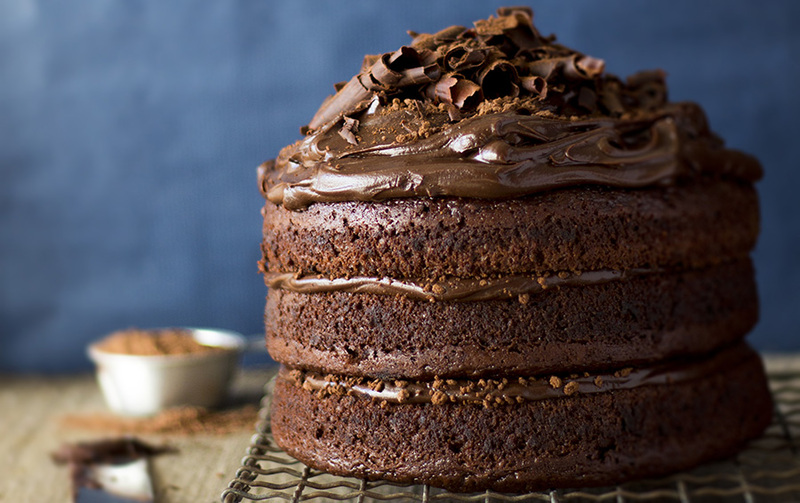 The cake itself is my absolute favourite and ticks all the boxes of the perfect chocolate cake: moist, not too sweet and easy. It has an absurd amount of water in the batter but rest assured, this is the secret to a deliciously moist cake as the flour absorbs all the liquid when you give it a chance and that’s exactly what stops the batter from being dry. It’s perfect for tray-bakes for church bazaars or even as cupcakes. 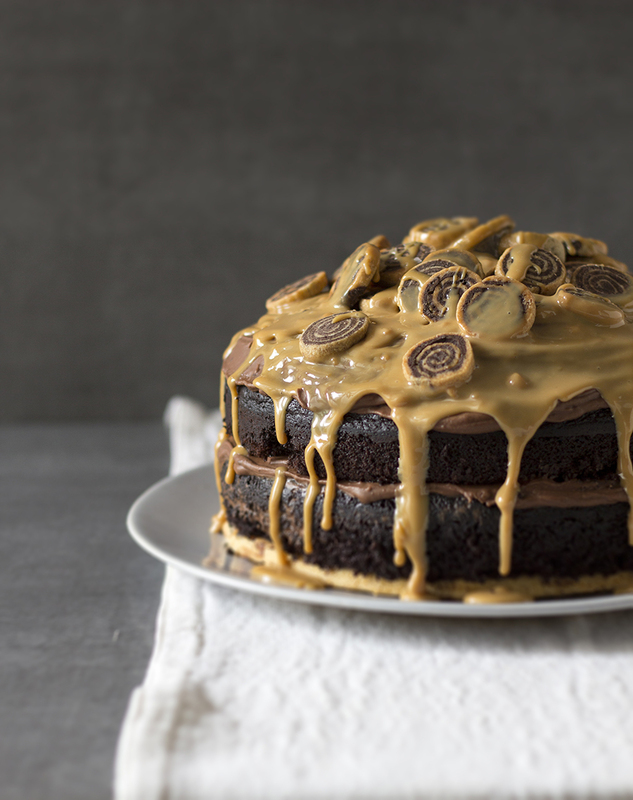 As if the cake wasn’t good enough on it’s own, I’ve piled it with layers of chocolate, caramel and shortbread, inspired by my favourite millionaire treat. 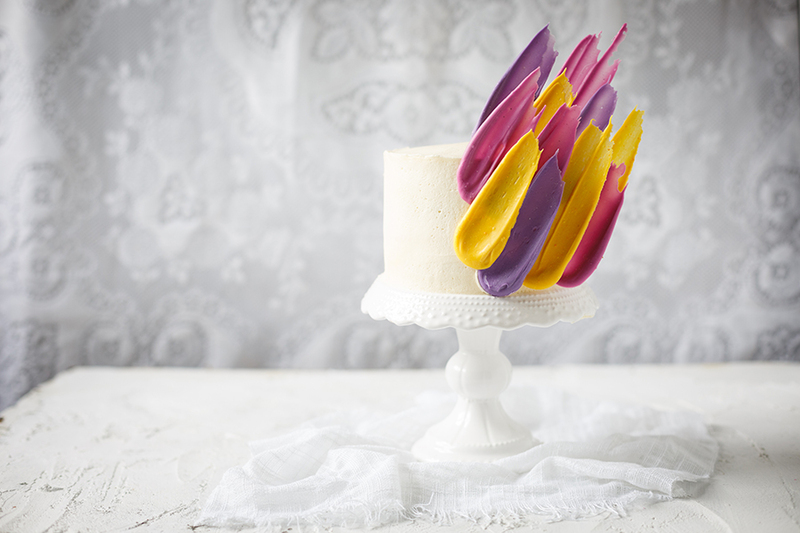 If this cake doesn’t have the wow factor then I dunno. Preheat oven to 160C.Boil water then add oil and sugar. Stir until the sugar is dissolved and then pour over the chopped chocolate. Stir until smooth. Whisk eggs lightly then stir in the chocolate mixture. Fold in the combined dry ingredients. Let mix stand covered for 1 hour. Place the batter into 2 x 24cm springform cake tins lined with baking paper and bake at 160C for 25 minutes or until a skewer inserted comes out clean. For the shortbread, cream the butter or margarine and sugar until light and fluffy. Gradually add the combined dry ingredients to form a soft dough. Roll out the dough and cut into a 24cm disc. Place on a greased baking sheet and bake for 10-15 minutes or until crisp and golden. 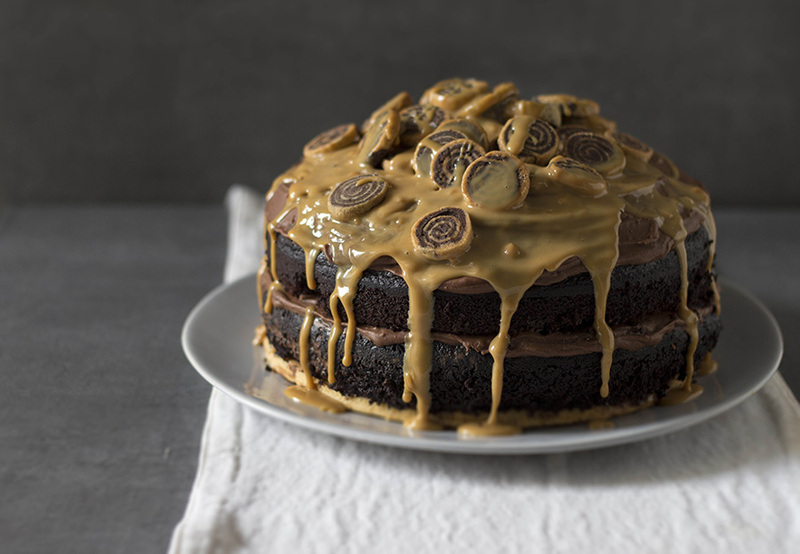 Assemble the cake by starting with a shortbread layer, spread some salted caramel on the bottom then place the chocolate cake on top followed by the chocolate topping. 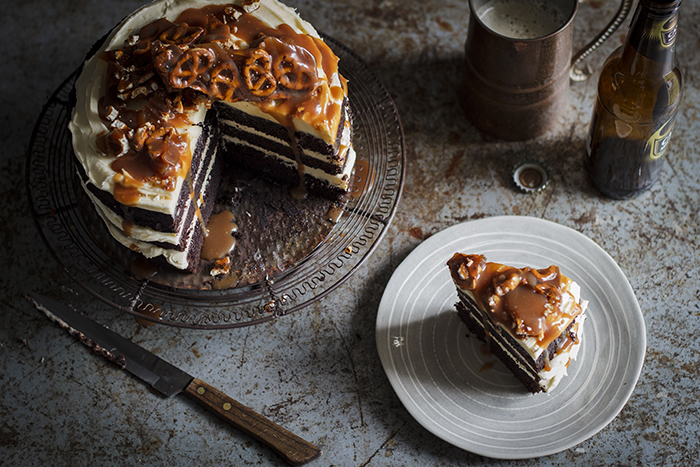 Repeat this process finishing with chocolate and a drizzling of salted caramel. Decorate with the leftover crushed shortbread. TIP Take a shortcut by buying ready-made caramel and chocolate spread instead of making your own!